There has been so much snowfall in Europe these past few weeks. 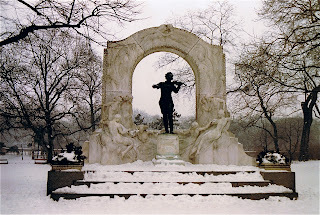 Johann Strauss II looks lonely and cold in the Stadtpark in Vienna. This gilded bronze monument is one of the most known and most frequently photographed monuments in Vienna. Check out other bloggers' travel photos every Photo Friday at DeliciousBaby.com. I have a picture of Allison and me at that exact spot. Of course it was August, so it was not nearly as captivating! I've have yet to see snow in Europe. It's on the list! I've never seen a picture of this monument before but I can't believe that it could possibly look more beautiful than it does here. The snow is a perfect accent! Wow, that is quite a lot of snow! I didn't see this statue when I was in Vienna in September. Nice photo. I love how the statue stands out in all that snow. I haven't to Europe in the winter and I bet all those incredible statues and landmarks look amazing in snow. So pretty the Strauss statue in Vienna. I've actually never seen it surrounded with snow. That statue looks really cool in this photo, great shot.